The cover made me think this would be a fast-paced read, and I was up for that! Raleigh West works in an auto shop day and night, trying to put his broken past out of mind. It's been seven years since the fiery crash that landed his teenage sweetheart in the hospital . . . and him in jail. 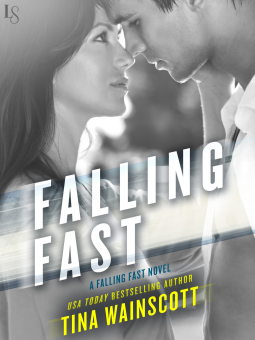 In an instant, he lost everything: his passion for racing, his hope of escaping his father's shameful legacy, and the only girl he ever loved. Raleigh hasn't seen her since that awful night. Never got a chance to apologize. And never forgave himself, either. When brave, beautiful Mia Wentworth returns to the Florida coast for the first time in what seems like forever, it's not to see Raleigh. Even so, the moment she arrives she can feel his presence like a gust of wind that gives her goose bumps. Opening her heart to him again seems impossible. But staying away? That might be harder still. Lucky for them both, Mia's never been the kind of woman to take the easy way out. So, I really liked Falling Fast. This is a second chance romance for a couple who met and fell in love when they were both in their late teens, and then were separated by a horrific car crash and some very protective parents. I loved Raleigh--he's got that hard-working, responsible, struggling for a better life thing going on. Despite his racy (ha ha ha) past, Raleigh's turning things around, trying to do better. Mia, for her part, is ever so slowly stepping out of her parents' over-protective bubble, ready to experience life again. I loved that both characters are striving for something better even before the book begins. When they're finally reunited (I say finally, but it happens right at the beginning of the book), I thought the chemistry was fantastic. I really wanted these two to reconcile, to find a way to make things work. I cheered through the first kiss. Other than Mia's parents being jerks, there's not a lot of conflict in the book until a twist that comes in the third quarter. I thought it fit the general tension of the story, and it didn't come out of left field, which made me happy as well. As new adult goes, this wasn't the most angsty book I've read, so thumbs up on that front. Raleigh's pessimistic about the opportunities available to him, and Mia's pretty sensitive about her scarring (which seemed fair to me, really), but there wasn't a ton of wallowing. While I would have appreciated another flashback or two to the couple during their teens, I thought this was a sweet romance with just enough edge from various plot points (and the car racing) to provide balance. I recommend this one, particularly if you like mechanics, or heroines who don't wallow in self-pity. Mia's a true survivor, and I respect that!